For a time, it seemed as if the 25th anniversary of the 1986 Chernobyl nuclear disaster might come and go relatively unnoticed and unremarked, at least by those persons with no direct experience of it. The nuclear accident at Chernobyl (Chornobyl’ in Ukrainian) came to be seen as a quintessentially “Soviet” phenomenon, the devastating consequence of systemic problems in the Soviet system of government. The world got comfortable with the assumption that the Chernobyl catastrophe was the product of a specific place, time, and flawed system—a terrible exception that could not happen anywhere else. Then on March 11, 2011 came the horrific earthquake and tsunami in Japan, and the escalating crisis at the tsunami-damaged Fukushima Daiichi Nuclear Power Station. As the Fukushima accident unfolded and the extent of radioactive contamination was revealed (?! ), the world wondered: Is this another Chernobyl? A month after the earthquake the Japanese government classified the accident as a Category 7 disaster, the same as Chernobyl. No doubt comparisons with Chernobyl will be elaborated, negotiated, challenged, and rejected as the situation develops at Fukushima Daiichi. For now, the renewed awareness of the 1986 Chernobyl nuclear accident—which coincides with the event’s 25th “anniversary”—provides an opportunity to ponder the multiple kinds of fallout the disaster produced: health, environmental, social, cultural, and political. In the first sentence of this piece, I made an oblique reference to “persons with no direct experience” of Chernobyl. It is my phrase, yet I do not know what it means. Chernobyl is experienced in myriad ways and is many things to many people. For people the world over with any kind of personal or historical memory of the accident, it seems almost impossible not to have experienced Chernobyl in some way. For some, Chernobyl is an important (if not the) defining event of their lives. Many people in Ukraine and Belarus—particularly the 135,000 persons who were permanently evacuated from their homes in the contaminated territories, and those who have suffered chronic health problems attributed to radiation exposure—divide their lives into pre- and post-Chernobyl. The more than 600,000 clean-up workers (the so-called “liquidators”), many of them military conscripts, did Chernobyl’s dirty work with minimal or no protective gear “cleaning up” the contamination, “liquidating” the accident, and “entombing” the damaged Reactor No. 4 in a huge concrete “sarcophagus.” Some of the liquidators have suffered diverse radiation-induced health effects (leukemia, other cancers, and skin diseases, among others), and are sometimes referred to as “bio-robots” (Petryna 2002). After all, a group of these men completed the tasks that robots could not: Robots initially were used to clean up some of the radioactive debris, but due to the extremely high levels of contamination the electronic mechanisms powering the robots failed. Humans were assigned the job instead. Visitors to the National Chernobyl Museum in Kyiv (Ukraine’s capital city of 2.7 million) (most visitors are Ukrainian schoolchildren or foreigners) experience Chernobyl through a filter of carefully-constructed displays (Phillips 2004) that alternatively emphasize the “facts” of the accident, the religious symbolism pervasive in popular interpretations of the disaster, international post-accident cooperation, and Chernobyl’s devastating health consequences for children. Vernacular readings are nearly absent from this official story, and are limited primarily to a scattering of unremarked photographs and personal documents through the museum. National Chernobyl Museum, Kyiv. Personal photos of Chernobyl evacuees. Tours to the contaminated “exclusion zone” offer a different Chernobyl experience; Chernobyl’s toxic tourism enables visitors to trek through an evacuated “nuclear wasteland” by vehicle and on foot. Bizarrely, an increasing number of Chernobyl tourists are avid gamers and enthusiasts of the S.T.A.L.K.E.R. video games (e.g. Shadow of Chernobyl and Call of Pripyat), in which players battle zombies, mutant animals, and other improbable foes in a hyper-sensationalized contaminated “zone of alienation.” (Imagine Chernobyl’s absolute worst possible effects, multiply by ten, add steroids, bring on the Kalashnikovs, and you have S.T.A.L.K.E.R.) One suspects that after battling through a surreal virtual “zone of alienation” these gamer-tourists probably experience the “real” Chernobyl zone as something of a letdown. On the other hand, there is much that is unexpected about the supposedly “uninhabited” 30- kilometer zone around Chernobyl. Depending on the season several hundred people live in previously abandoned houses in the zone. Called samoseli—“self-settlers,” these people receive food, medical care, and social services from the Ukrainian state, but also grow their own food in the often highly-contaminated soil. And contrary to popular stereotypes of post-Chernobyl mutant wildlife, the zone actually boasts an incredibly varied and robust array of animals. Bird life is particularly vibrant, and since the zone’s evacuation between 250 and 280 bird species have been sighted, 40 of them rare or endangered (Mycio 2005:85). Although some negative effects are evident, in many respects the radiation has been beneficial for the zone’s wildlife because it got rid of the animals’ number one natural enemy—people. This reality has generated some discussion about potentially converting the zone into a national park that could serve simultaneously as a wildlife refuge and a memorial to Chernobyl’s victims. Others would like to forget Chernobyl; they are weary of Chernobyl’s moral, symbolic, and more tangible health burdens and wave away questions about the disaster. During ethnographic research in Ukraine about post-Chernobyl healing strategies during the 1990s, my queries about people’s experiences and memories of Chernobyl sometimes were shrugged off: “Chernobyl was ten years ago; we’d just like to forget about it. Chernobyl is the one thing foreigners know about Ukraine.” The younger generations in Ukraine sometimes read Chernobyl as an embarrassment or dirty word—a stain on the country’s reputation that they wish would disappear. But Chernobyl is not going away, as the world’s sudden recollection of Chernobyl during the Fukushima Daiichi NPP crisis reveals. From one day to the next, Chernobyl made conscious what has already been true for a long time: not just in the nuclear age, but with the industrial universalization of chemical poisons in the air, the water, and foodstuffs as well, our relation to reality has been fundamentally transformed. To use a famous analogy, private control over the means of perception has been overthrown…this means that the reality of the danger is always and necessarily administered in a centralized fashion. We are at the mercy of social institutions: weather services, mass media, cabinet offices, officially determined tolerance levels, etc. (p. 155). Even more, as Beck notes, Chernobyl revealed that “those who until now have pretended to know don’t know it either. None of us—not even the experts—are experts when it comes to the atomic danger” (p. 157). The inadequacies of “expert knowledge” in disaster situations were again made apparent during the 2010 Deepwater Horizon oil spill in the Gulf of Mexico—a long series of failed attempts took months to stop the spillage of oil and it was obvious that no one knew what to do. Similarly during the Fukushima Daiichi NPP crisis, the world watches uneasily as Japanese nuclear “experts” attempt containment of the disaster through trial and error. Social scientists studying Eastern Europe have noted that Chernobyl’s anthropological shock seems not to have registered as strongly (and in some cases not at all) in the countries most directly affected by the disaster—Belarus, Ukraine, and Russia. A possible reason for this “non-shock” may be that citizens of the Soviet Union already knew they were at the mercy of social and political institutions and by 1986 they had little confidence in experts and expert knowledge; Chernobyl merely confirmed what everyone already knew. This is not to say that Chernobyl did not foster a shift in consciousness in these countries. In the case of Soviet Ukraine, Chernobyl often is interpreted as the “last straw,” the final signal that Moscow cared little for the Ukrainian SSR’s best interests. The acceleration of the Ukrainian independence movement (e.g. Rukh, the People’s Movement of Ukraine)—which was closely tied to the Green movement—is linked back to the Chernobyl accident and its aftermath. The situation unfolded rather differently in Belarus, where mass protests concerning Chernobyl emerged only in 1989 when detailed maps of the contamination were published. In Belarus, the disaster subsequently has been spun in different ways by competing political factions to achieve particular ends (Kasperski 2011). Terrible, transformative events such as the Chernobyl disaster have to be culturally processed. 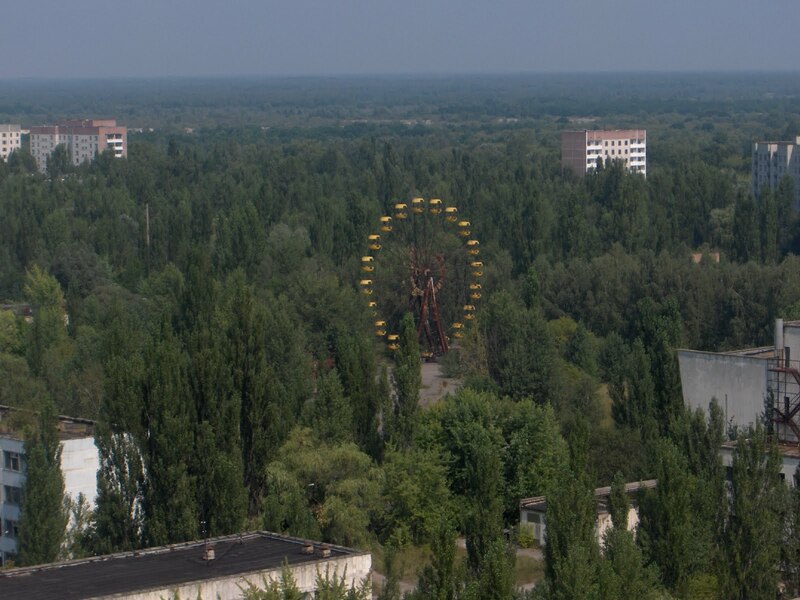 Chernobyl has produced a rich corpus of cultural symbolism, as is evident in the proliferation of Chernobyl-inspired poetry, literature, visual art, theater, film, and even the more recent gaming culture of the S.T.A.L.K.E.R. generation. Chernobyl frequently is imbued with religious meaning; for example, it is assigned significance as a perceived affirmation of Revelations 8: 10-11, which prophesied that a great star called “Wormwood” would fall from the heavens and poison the water. (Actually the Chernobyl plant is Mugwort (Artemisia vulgaris), not Wormwood (Artemisia absinthium), but the two frequently are confused.) Early reflections on the disaster called Chernobyl a “warning bell,” and bells are now ubiquitous as Chernobyl symbols. The accident also is associated with the Biblical story of Adam and Eve who partook of the forbidden fruit (an apple—another prominent Chernobyl symbol), and thus accessed privileged and forbidden knowledge. The message is that humankind similarly “played God” in experimenting with the atom, with devastating consequences. Adam and Eve’s banishment from the Garden of Eden parallels the massive evacuation of the population living around the Chernobyl NPP. In this representation the Chernobyl disaster is a form of divine punishment for elevating science and technology over religion, an interpretation that resonates particularly strongly in the formerly atheistic Soviet Union. Drawing on this theme of the forbidden fruit, the National Chernobyl Museum in Kyiv features apples in its official logo and in many of the museum’s displays. Many poetic, artistic, and museum renderings of Chernobyl ponder the tensions between the technical and the spiritual, and correspondingly emphasize the techno-religious split: the trappings of the nuclear enterprise (gas masks, lead suits, “hazardous, radiation” symbols) are frequently juxtaposed with religious symbols (icons, crosses, prayer books). Orthodox iconography has incorporated Chernobyl as well—worshipers venerate icons of the Chernobyl Saviour, Our Lady of Chernobyl, and the Mother of God of Chernobyl, for example. National Chernobyl Museum, Kyiv. The icon of the Archangel Gabriel (left) was retrieved from an abandoned church in the exclusion zone. The earth is no longer visible, thanks to our footprints. And don’t act like you’re surprised at the state it’s in. Overall, however, the relative lack of interest and critical commentary among residents of Ukraine and Belarus regarding the Fukushima Daiichi NPP crisis suggests that Chernobyl’s resonance as a political and culturally symbolic event has waned. Early media reports in Ukraine drew comparisons with Chernobyl, but news about the “Japanese nuclear crisis” quickly became routine and unremarkable. The Belarusian media practically ignored Fukushima; in fact, during the crisis Belarus actually signed an agreement on the construction of a new nuclear power plant. The Ukrainian and Russian blogospheres evidenced some connections being made between Chernobyl and Fukushima Daiichi in the popular imagination, but to a much lesser extent than one might expect. The green movement in these countries is practically non-existent, and the Japanese crisis did not produce significant protests by environmentalists. By contrast, in the wake of Fukushima, German Chancellor Angela Merkel declared a moratorium on nuclear energy and required that Germany’s older generation of NPPs immediately be shut down and inspected; the Japanese nuclear crisis also sparked anti-nuclear public protests in Germany. Exploring Chernobyl’s symbolic fallout enables one to understand some of the important socio-political aspects of the disaster’s lasting effects. But we must not forget that the shock of Chernobyl (“anthropological” or otherwise) resonates in a different register for persons whose physical health has been compromised by exposure to radioactive fallout. One of the first interviews I conducted as a novice ethnographer in Ukraine in 1996 was with Vera, a young woman living in a village built for Chernobyl evacuees outside Kyiv. In 1986 Vera was a shop clerk in Pripyat, the “nuclear city” near the Chernobyl NPP that housed the plant’s workers. In the days following the April 26 accident Vera was forced to “volunteer” to remain in Pripyat to fill sandbags; these were subsequently loaded into helicopters and dropped into the fuming Reactor No. 4 in an attempt to contain the fires and stem the release of radioactive contaminants. Vera was told she must take part in the “liquidation” efforts or lose her job; she could not have known that the city would be permanently evacuated and she would lose her job anyway. Vera described to me the strange physical sensations that marked her liquidation experience: an extreme and unquenchable thirst, an unpleasant metallic taste in her mouth, headaches and nausea. When I met her 10 years later Vera described her bodily state as one of extreme weakness and “indescribable pain.” She told me she was suffering from “radiation AIDS,” an anomalous condition of fatigue and general weakening of the immune system that is popularly associated with Chernobyl. Vera’s son was born a few years after the disaster, and as we talked she wondered aloud if he would suffer Chernobyl-related ailments, too. We were nearly the same age, but Vera’s knowledge of disaster, disability, relocation, and troubled motherhood were so far from my own experiences that she seemed my elder—like a wise, kind, yet exhausted aunt. Meeting Vera was the first time I encountered Chernobyl not as the failure of a flawed regime, an historical event that got woven into national and cultural narratives, or a fantastic scenario straight out of science fiction. Vera brought me face to face with Chernobyl as a human tragedy that inscribed itself on bodies and transformed individual lives. I lost touch with Vera, but I often think about her and wonder what her life is like now. If, that is, Vera is still alive. Time passes quickly, and now Chernobyl is part of my own family narrative. The accident likely played a part in my father-in-law’s chronic health problems, disability, and death. Petro was hired in 1986 and 1987 to a construction brigade building new housing for Chernobyl evacuees. Inexplicably, the houses were built not on “clean” territory, but in an area of some contamination—the so-called “third zone” of “periodic control” where contamination of cesium-137 ranged from 5 to 15 Curies per square kilometer. For this work Petro also did a lot of driving in and out of more highly contaminated areas. Family lore has it that Petro, an avid fisherman, frequently slipped into the 30-kilometer “exclusion zone” where the fishing was unbelievably good. During his final years Petro was recognized as a Chernobyl “sufferer;” he was granted early retirement, a special pension, and free specialized medical treatment (i.e. the removal of most of one lung). After he died, one of my mother-in-law’s most important tasks was to transfer Petro’s Chernobyl sufferer’s pension to herself. So along with his other meager possessions, Tetiana inherited Petro’s Chernobyl tie. The collective/individual survival strategy of biological citizenship represents a complex intersection of social institutions and the intense vulnerabilities of populations exposed to the determinations of the international political economy; it is also part of a larger story of democratization and new structures of governance in the postsocialist states (2002:218). In many ways, securing a “Chernobyl tie” and the requisite material benefits has become a survival strategy for a certain segment of Ukraine’s population. Petryna has attended ethnographically to how, given the indeterminacies of Chernobyl’s health effects and the difficult political economic environment, the Chernobyl claims process can be quite subjective and subject to manipulation. It is difficult to pinpoint what health problems are directly attributable to Chernobyl; as with Petro, it is impossible to disentangle radiation-induced health effects from problems caused by smoking, poverty, poor nutrition, stress, and alcohol abuse—all symptoms of the difficult situation in post-Soviet countries since the late 1980s. Thus, one has to approach Chernobyl related health data not to discover “facts” about the disaster’s consequences, but more as an exercise in socio-political analysis of the perspectives and vested interests of those generating the statistics. In 2006, a report offered by a conglomerate of international organizations called the Chernobyl Forum suggested that liquidators, evacuees, and persons living in very contaminated zones could expect an increase of just 4,000 cases of fatal cancers above the expected 100,000. The Chernobyl Forum report further identified a rise in thyroid cancers as a primary health effect of Chernobyl—a widely agreed-upon finding—and noted a significant increase in eye problems among children. Despite attempts to downplay the 1986 nuclear catastrophe’s deleterious effects, there is no doubt that Chernobyl is, in fact, Forever. Residents in territories with contaminated soil and water are still consuming foodstuffs laced with radionuclides (Phillips 2002). In March 2011 a team of Greenpeace scientists found that 14 out of 15 samples of milk gathered in the village of Drozdyn in Rivnenska Oblast (located in Zone 3) exceeded the Ukrainian Acceptable Levels for Children for cesium-137 by factors ranging between 1.2 and 16.3 times (Greenpeace International 2011). The so-called “Red Forest” near the Chernobyl NPP is one of the most radioactive outdoor environments on the planet—the evergreen trees there contain up to 500,000 becquerels of cesium and 7 million becquerels of strontium per kilogram of wood (Mycio 2005:38). The unfolding crisis at the Fukushima Daiichi NPP in Japan has prompted memories of Chernobyl, and rightly so. But at the “Silver Anniversary” of the world’s worst nuclear disaster we must remember Chernobyl not as an unfortunate historic event of the past, but as a catastrophe that 25 years later continues to damage life. Beck, Ulrich. 1987. “The Anthropological Shock: Chernobyl and the Contours of the Risk Society.” Berkeley Journal of Sociology 32: 153–165. Greenpeace International. 2011. Pilot investigation of food products contamination by caesium-137 in selected areas of Ukraine affected by the Chernobyl catastrophe in 1986. Amsterdam: Greenpeace International. Kasperski, Tatiana. 2011. “Chernobyl’s Aftermath through Political Symbols, Monuments and Rituals: Framing, Remembering and Forgetting the Disaster in Belarus.” Paper presented at the International Conference “After Chernobyl,” Potsdam, Germany, April 7-8, 2011. Mycio, Mary. 2005. Wormwood Forest: A Natural History of Chernobyl. Washington, D.C.: Joseph Henry Press. Petryna, Adriana. 2002. Life Exposed: Biological Citizens After Chernobyl. Princeton: Princeton University Press. Phillips, Sarah D. 2002. “Half-Lives and Healthy Bodies: Discourses on ‘Contaminated’ Foods and Healing in Post-Chernobyl Ukraine.” Food and Foodways 10(1-2):27-53. Phillips, Sarah D. 2004. “Chernobyl’s Sixth Sense: The Symbolism of an Ever-Present Awareness.” Anthropology and Humanism 29(2):159-185. The Chernobyl Forum: 2003-2005. 2006. Chernobyl’s Legacy: Health, Environmental, and Socio-Economic Impacts, and Recommendations to the Governments of Belarus, the Russian Federation, and Ukraine. Vienna: IAEA. Sarah D. Phillips is associate professor of anthropology at Indiana University, Bloomington. She is author of Disability and Mobile Citizenship in Postsocialist Ukraine (2011, IU Press) and Women’s Social Activism in the New Ukraine (2008, IU Press). Fukushima is not Chernobyl? Don’t be so sure. Phillips S. Chernobyl Forever. Somatosphere. 2011. Available at: http://somatosphere.net/2011/chernobyl-forever.html/. Accessed April 25, 2019. Phillips, Sarah D.. 2011. Chernobyl Forever. Somatosphere. http://somatosphere.net/2011/chernobyl-forever.html/ (accessed April 25, 2019). What a magnificent piece of work! Thank you for revisiting Chernobyl! It is always a timely topic for those for whom Chernobyl is a part of everyday. In 2008 when I was interviewing physicians in Ukraine about unrelated issues, they routinely brought up Chernobyl as a major actor in their considerations of diagnoses, decisions about appropriate therapies, vaccinations, and a number of other issues. The "invisible threat" vividly persists as a part of local ethnomedical ideas. As you accurately pointed out, it has also transformed into a type of capital – a notoriety that draws artists, journalists, tourists. And as I was booking my tickets for China on a day when Japan released its statement about the severity of the damage to the nuclear power plant, I caught myself thinking whether $500 lower price for route stopping in Japan was truly a better deal at this moment. Pingback: Haiti, Fukushima, Chernobyl: What do we learn from disasters? | Medical Anthropology at Oakland U.